The game's post-launch DLC plans detailed. 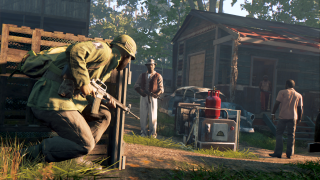 Mafia 3 is getting a load of downloadable content after release, including new car customisation options, a bunch of extra outfits for protagonist Lincoln Clay, and vehicle races. That lot will be free to owners of the game, whether they pre-ordered it, bought it on day one, or waited a bit to see if it's actually any good, and while there is also a pile of pre-order bonus tat on offer, that looks fairly inconsequential compared to these meaty morsels. You can read the entire rundown of Mafia 3's post-launch DLC plans here, but I'll give you the highlights. In addition to the stuff above, there will also be a few free golden guns, and three paid story expansions covered by the season pass. 'Faster, Baby!' features "fast cars, dramatic chases, and stunt driving [as] Lincoln joins forces with his former flame, Roxy Laveau, to take down a corrupt Sheriff terrorizing Civil Rights activists on the outskirts of New Bordeaux". That one really sounds like an episode of Quincy. Meanwhile, 'Sign of the Times' has you investigating a ritualistic, drug-fuelled cult, and 'Stones Unturned' makes Lincoln "join forces with CIA agent John Donovan to settle a blood feud that began in the war-torn jungles of Vietnam". Those three paid expansions will also bung in "exclusive vehicles, weapons, outfits and races based upon their themes", so expect some Vietnam and hippy paraphernalia to go with them. Mafia 3 is out October 7.